Bilbo Baggins lives a quiet, peaceful life in his comfortable hole at Bag End. Bilbo lives in a hole because he is a hobbit—one of a race of small, plump people about half the size of humans, with furry toes and a great love of good food and drink. Bilbo is quite content at Bag End, near the bustling hobbit village of Hobbiton, but one day his comfort is shattered by the arrival of the old wizard Gandalf, who persuades Bilbo to set out on an adventure with a group of thirteen militant dwarves. 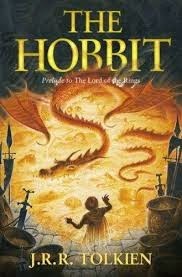 The dwarves are embarking on a great quest to reclaim their treasure from the marauding dragon Smaug, and Bilbo is to act as their “burglar.” The dwarves are very skeptical about Gandalf’s choice for a burglar, and Bilbo is terrified to leave his comfortable life to seek adventure. But Gandalf assures both Bilbo and the dwarves that there is more to the little hobbit than meets the eye. The book starts with introduction of the hobbits and slowly to THE hobbit, Bilbo Baggins. He is kinda quite guy like the retired quite silent people and then one fine morning Gandalf the Grey enrolls him for and Adventure. Although he refuses he finds himself outside with 13 dwarves on quest to reclaim the home land. This book is quite fantastic. It has very great twists and some deaths which give Glory to the tale. I Loved it to hell. Sad thing is there is NO LOT of strong dialogue but its powerful. The book has some very true internal lessons about how people change, how narrow patriotism will demolish you, how greed is really bad in your life. Its quite good. The pace is good not too fast where you can get headaches nor too slow where you have to stop falling from sleep. And also there are lot of poems or songs which are amusing. The book also comes with some illustrations and two maps which you can refer any time. There are great fantasy elements like giant Eagles on which you can sit, wargs and High elves and orcs and One Great Magnificent Dragon whose description is so great that you can almost smell it! There are some parts which you really don't believe and start laughing. There are some parts where you mourn a lot and curse whole life but at the end, it's quite extraordinary tale. There are no loose tails but one. And that one is completely another story that is Lord of the Rings. Many people consider Lord of the Rings as great one but this, is a beautifully sculptured and carefully carved Epic. Tags: Epic Fantasy, J.R.R. Tolkien, Troubler. Lovely review. Though i left the book first time i picked it , but when i got the hang of the fantasy books, i enjoyed this one. Still LOTR is my choice among the two.